Baltimore's favorite food personality is now gaining national recognition with his down-home style, no nonsense love of food, and recipes so simple and delicious folks everywhere will be saying: "I can cook, what he cooks!" 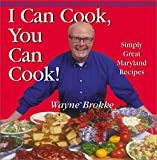 From his days as the proprietor of Baltimore's first casual restaurant to the popular Wayne's Bar-B-Que located on the Inner Harbor, Wayne Brokke is truly an American original. Now, more than 150 of Wayne's recipes are available to anyone who wants to enjoy simple, fast, and delicious home cooking that's more than just comfort food, it's comfort for the soul. Peppered with Wayne's unique anecdotes, these easy-to-follow recipes also include Wayne's special hints for cooks that encourage experimentation and creativity. I Can Cook, You Can Cook! includes outstanding soups, salads, entrees, vegetable dishes, desserts, breakfast, and cool summer drinks, as well as helpful information Wayne has learned on his lifelong cooking odyssey. About the Author: Wayne Brokke began cooking at the age of five and just never stopped. He has been a restaurateur for more than twenty years. From his Sundae Times Ice Cream Parlor and The Soup Kitchen, Ltd., to Wayne's Bar-B-Que and full line of sauces and cornbread, Brokke has mastered the comfort foods that keep hungry customers coming back to him again and again.